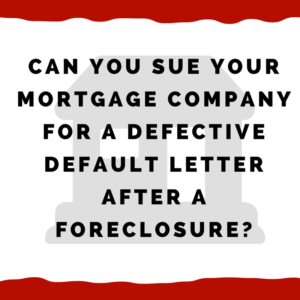 Can you sue your mortgage company for a defective default letter AFTER a foreclosure? You were foreclosed on by your mortgage company. And you are likely still feeling the effects of this — maybe you have been sued for ejectment, there is a deficiency balance allegedly owed, you had to uproot your family to move, etc. It may seem as if all hope is gone — your mortgage company got away with this. But there may yet be hope…. In a very surprising development, the law in Alabama has actually improved for consumers. Very unusual and we need to take this opportunity to make things right. This all relates to your “default letter” or “notice of default” that you would have received before the foreclosure. If it was defective, this may give you the right to sue your mortgage company. Let’s take a step back and look at how a foreclosure happens. If we can show the default letter was defective, then the acceleration is invalid. That makes the foreclosure invalid as well! This is because the default letter is the critical first step in the process that leads to a foreclosure. So how do we find out if the default letter was defective? Do you have your mortgage handy? If you do, take a look at around paragraph 22 and see if you find anything like this. Or send it to us and we’ll look through it for you. If you do not have your mortgage, then you can pull it from your probate court (often online). Or you can call us at 205-879-2447 and we can help you find your mortgage. OK, once you have your mortgage, what do we do next? Now we need to compare your default letter or notice of default with the mortgage that we quoted above. Do they match or not? If your default letter expressly tells you that you have the right to bring a court action then that default letter is likely valid. Many of the default letters are defective. The mortgage companies tried to argue (and many judges bought this) that this is “close enough” or “good enough”. You see, the defective notice does not tell you that you can bring a lawsuit. So it makes you think the mortgage company will be suing you for a foreclosure and in that foreclosure action you can assert a defense. But in Alabama there is no foreclosure action or court case — it is “non-judicial” — so there is nothing and nowhere to “assert a defense”. You are tricked into not filing a lawsuit. Then once the non-judicial foreclosure happens, you are out of luck. And out of your house. Our Alabama Supreme Court said this can make the foreclosure invalid. So it is mission critical to find out what your default letter says and compare that to the mortgage. Do you have your default letter? If you do, please send to us as soon as you can so we can compare to your mortgage. There are some strict time limits so we need to hustle. If you do NOT have your default letter, we may be able to help you get it from your mortgage company, especially if your foreclosure was less than 1 year ago. What does it mean if your default letter is defective — what can you do? If you could, would you want your home back? For some people, this is “Absolutely yes!!”. Others have literally and metaphorically “moved on” and have no desire to go back to their house. If you want your house back, then that’s the primary goal. Get the foreclosure undone (declared void) and then move back and resume doing business with your mortgage company. But if you don’t care about getting the house back, then your focus will be on suing for money damages and removing any credit reporting from your old mortgage company. So what laws can we use? The starting point is Alabama law on following the contract (mortgage) just as it is written. When the default letter is no good, then the mortgage company had no right to foreclose. Then we look at the FDCPA (Fair Debt Collection Practices Act) to see if your mortgage company was considered a debt collector. There is a one year statute of limitations on this type of lawsuit so keep that in mind. Many times your mortgage company is considered a “debt collector” under the FDCPA. If the mortgage company foreclosed without the right to foreclose, then this will almost certainly violate the FDCPA (assuming it applies). This allows you to sue for money damages and force the mortgage company to pay for your attorney fees. Next, we see if we can use the FCRA (Fair Credit Reporting Act) because most likely your mortgage company has told the credit reporting agencies that you were foreclosed. Well, if the foreclosure was invalid, then that hardly seems accurate, does it? So we look at the FCRA. Now, often we will dispute the false information to give the mortgage company a chance to fix its reporting. When it doesn’t, we sue for compensatory and punitive damages (as well as attorney fees) under the FCRA. Then we look at RESPA (Real Estate Settlement Procedures Act) to see if there have been violations or if we can send proper RESPA letters asking your mortgage company questions and asking them to undo the foreclosure. If the foreclosure was illegal, this may violate RESPA. And we often will send notice of error letters or request for information letters and when the mortgage company violates the law on those letters, we sue. Here’s what we suggest you do now. See what you have and then call us immediately at 205-879-2447. Ask for Randi and she will help you investigate this. If we can sue, it may be a situation where we can undo the foreclosure. Or we can get you money damages. There are all sorts of interesting possibilities we have to turn the tables on your mortgage company.